Posted: August 27, 2016 6:40 p.m. 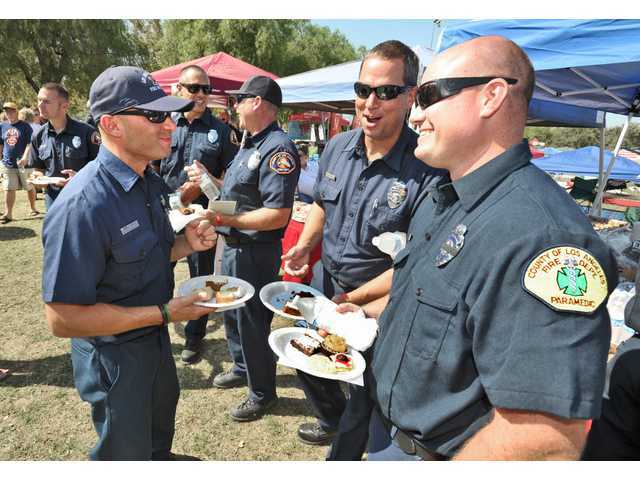 Updated: August 27, 2016 6:40 p.m.
Members of the Santa Clarita community came together Saturday afternoon to thank the first responders who saved residents’ homes, businesses, structures and lives during last month’s Sand Fire. 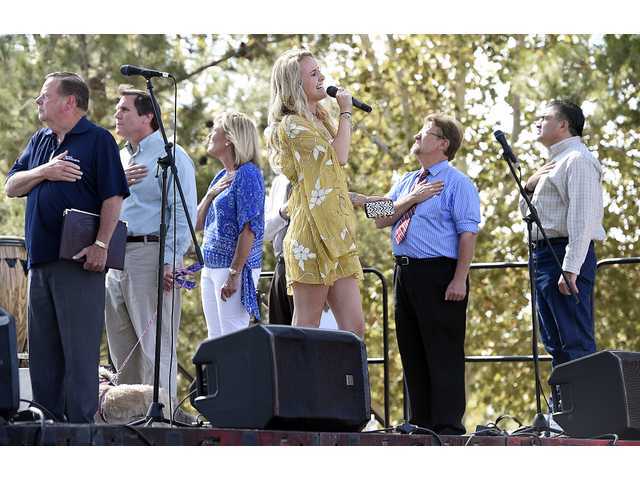 “This really was an idea from the fire department, the city and the radio station [KHTS] because so many wanted to give their personal thanks to the first responders and it was getting overwhelming,” said Adele Macpherson, board member of the Santa Clarita Disaster Coalition. 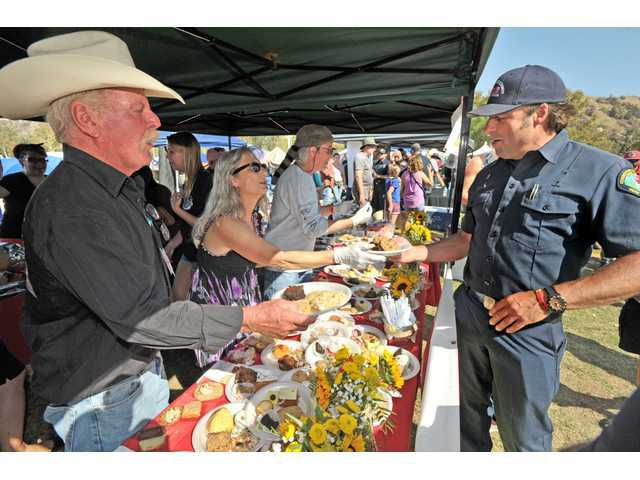 The event held in Santa Clarita’s Central Park acted as a single, unified location for local groups, schools, businesses and neighborhoods to shake hands with those who fought the Sand Fire’s flames and offer them refreshments and treats. It was also an opportunity for individuals to donate gifts and funds to the Disaster Coalition for Sand Fire survivors. “It was an opportunity for us to say thank you to all the first responders that did so much to save our community because it could have been somewhere else,” Sand Canyon resident Dave Hauser said. Gary Saenger, whose house backs up to open space in Sand Canyon, said his home was “1,000 percent” saved by the efforts of firefighters. “I am so relived because the fire came at us from the west and from the east and the south,” he said. Los Angeles County Deputy Fire Chief Vince Pena said the community support during and after the fire was second to none. “We have tons of thank you cards and letters and fancy artwork that are pretty amazing and are lining the walls of our fire stations,” he said. Los Angeles County Sheriff Cmdr. Mike Parker agreed that the community help and support made a difference in the emergency response efforts. 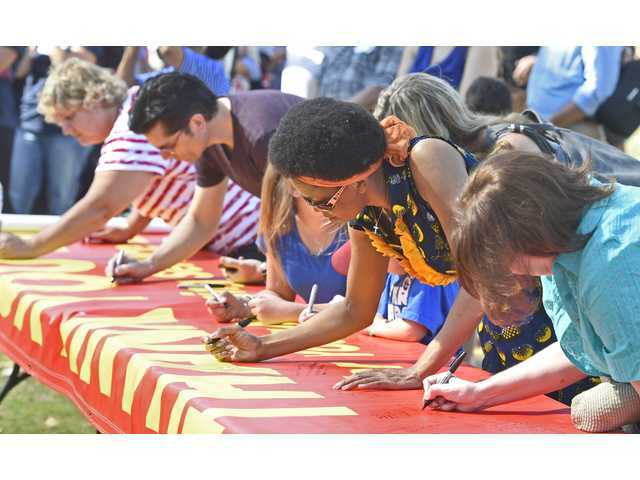 “Your community leaders stepped up and made it easier for firefighters to help the public. It’s not like that everywhere, but it’s like that here,” he said. Both Pena and Parker expressed their gratitude to the multitude of supporting agencies and cooperating departments that helped during the disaster. 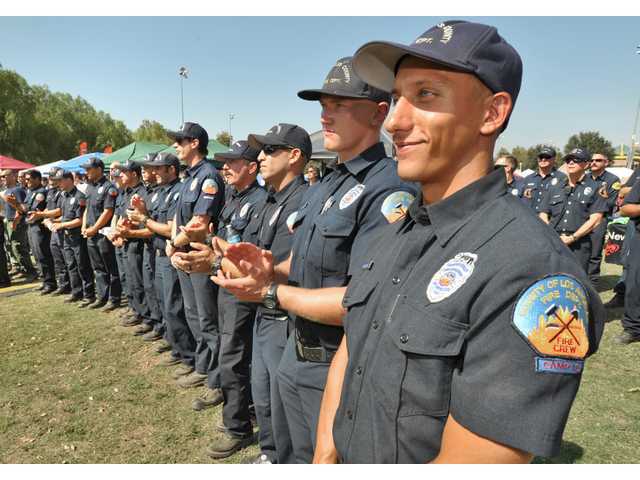 Agencies who answered the call included Los Angeles County Fire, California Highway Patrol, Los Angeles County Sheriff, Los Angeles School Police, the U.S. forest Service, the Red Cross and more. Santa Clarita Mayor Bob Kellar, a Sand Canyon resident for 37 years, said he had never seen a fire like the Sand Fire before. 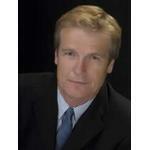 He believes that had it not been for the first responders, more homes would have been lost. “It was genuinely a team effort and everyone doing their utmost to give a maximum degree of protection and safety for our families,” Kellar said. Congressman Steve Knight echoed his remarks. “Without them we would have lost a lot of structures, a lot of lives and they are the true heroes of the day,” he said. Many said the responders’ actions were emblematic of what they do every day.